Freedom Seal is a visual mark that allows companies to publicly show to customers, business partners, governments and regulators their commitment with legal, ethical and moral obligations to take action to eliminate slavery from their supply chain. 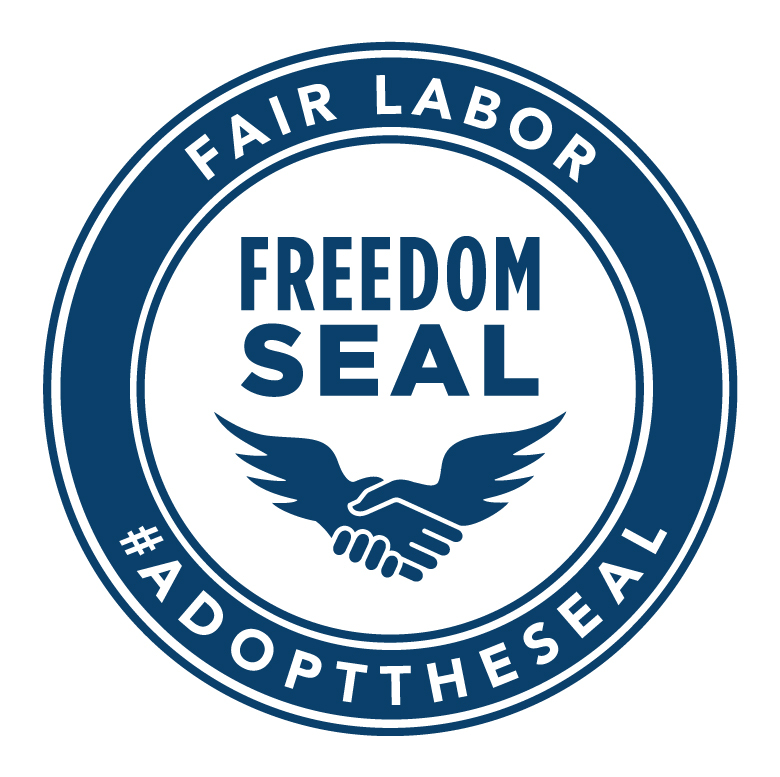 Ethical Toy Program, a leading responsible sourcing program, will support the launch of the Freedom Seal through its development, as well as supporting companies throughout the Freedom Seal application process. The Freedom Seal and Ethical Toy Program partnership brings together two organizations with unrivaled expertise in complex supply chain assessment and human rights protection. “The Freedom Seal is a solution that combines the power of technology, trusted data, expert consultation, support and access to services to help companies act to prevent slavery. We believe our vision can become the new normal through a global network of civilized corporations standing united for freedom. I welcome the leadership and support of the Ethical Toy Program in creating our partnership, now is a time for companies to communicate with society with transparency and to actively end slavery once and for all”, says Rani Hong CEO of Freedom Seal. Rani is a survivor of child slavery. She was kidnapped and sold into slavery in India, arriving in the US through illegal adoption at the age of eight. It has been her life’s goal to fight human trafficking and take action to eradicate slavery from our society. “Ethical Toy Program has always had a zero-tolerance position to all forms of slavery, such as forced labor, within our program. We want to support our members who share Rani’s vision of ending slavery once and for all. Through our robust in-factory assessment process we can verify that a corporation is taking action to eradicate slavery. We are proud to work with Freedom Seal to provide our members with access to expert support as we stand together to move beyond commitment to impact,” says Carmel Giblin, CEO of Ethical Toy Program. According to the International Labor Organization, there are 40 million slaves today in the world, of which 24.9 million are victims of forced labor by individuals and private companies. In 2013, Rani Hong appeared before the UN General Assembly in New York City to request the Sustainable Development Goals (SDG) number 8, specifically section 8.7, to focus on the human trafficking crisis. She successfully left her mark on the 2030 SDGs. Human trafficking not only breaks apart families and enslaves women, men and children; it also has a devasting socio-economic impact on individuals and communities around the world. Every year, it is estimated $2.4 trillion in proceeds from this and other causes of human misery such as forced prostitution, terrorism and drug trafficking are laundered through the world’s financial markets and banking systems. About the Freedom Seal: (www.thefreedomseal.com) Designed by Rani Hong in partnership with supply chain experts, thought leaders and representatives of more than 30 global corporations, Freedom Seal’s objective is to mobilize and influence decision-makers at the highest levels to improve awareness of the extent of modern slavery, promoting effective information sharing and establishing enhanced processes to share best practice. Corporations can apply for the Freedom Seal and if successful use it as a visual mark demonstrating to their customers, partners, government and regulators their commitment and actions to work in support of the eradication of slavery. Freedom Seal works with a variety of expert partners in the assessment and remediation provision and is the only survivor led organisation helping companies move from corporate commitment to transparency actions with impact. About Ethical Toy Program: The ICTI Ethical Toy Program (www.ethicaltoyprogram.org) is the leading responsible supply chain program for the global toy, entertainment and children’s products industries. Our mission is to build better lives for workers and a stronger industry through the ethical production of toys. We provide ethical certification, factory assessments and monitoring tools which enable toy brands, retailers and manufacturers to achieve their responsible sourcing aims and drive standards. Our worker well-being programs support thousands of frontline workers employed at toy factories around the world.